Well well well. Look what we have here- a darn birthday. MY (sorta) birthday!! You know how I love birthdays! I love celebrating these milestones with you guys! Remember this year's post?? What better way to celebrate this year, than with a GiVeAwAy! The only reason this blog is even alive is because of YOU guys- so it's totally fitting that with this blog's birthday fiesta, we also celebrate you lovely sweet friends. When preparing for this day, I figured I might as well also include and give a little shout out to some dear dear friends I have in real life or have made along the blogging way. These aren't just any friends, these are some of the most key people in my blogging life, that have influenced me, encouraged me when I needed it the most, AND brightened my journey during these last three years. I think it's also safe to say that without the love and support of these guys, this blog wouldn't have been as fun. And keeping true to their awesome nature, they've all decided to giveaway some AMAZING prizes to you guys! You know....all in the name of fun and to really get this party started! So without further adieu, allow me to introduce you to some of my very favorite peeps! 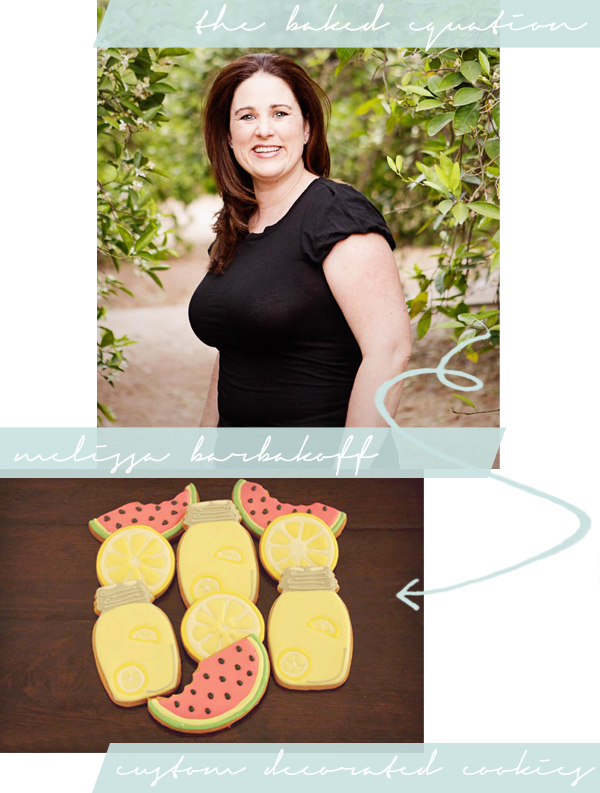 Melissa from The Baked Equation is not only a true cookie genius (seriously, head to her blog stat and check out her amazing cookie art!) but she also happens to be a very important sister in Christ, in my life. I love this girl. She is wise, fun, sweet, and not afraid to pour on the truth of the Gospel (which I need to hear always)! Melissa is the girl I know I can go to for encouragement and support, no matter what. AND having a successful blog and business, is always showering me with awesome truths and advice. She. Is. Plain. Awesome. So, not surprisingly, she has decided to shower one of Sweet Lavender Bake Shoppe's readers with a DOZEN CUSTOM DECORATED COOKIES (your choice)! I mean, WHAAAAAAAAAT??? Who does that. Goodness gracious. Now Sabrina, ahhhh Sabrina. There's way too much to say about this girl. When I first laid eyes on Superfluous by Sabrina Towns years ago, I was instantly in love. This was one of the first blogs I actually started "following", before I really even knew what that meant. This girl was FUNNY, quirky, truthful, real, and also a sister in Christ. So naturally, we began talking and sharing our lives with each other and quickly bonded over the silliest things *cough*dawsonscreek*cough*andfelicity*cough* and I would literally be laughing till tears came out over our emails and comments on each other's blogs. We've since kept in touch through emails to one another and shared more personal good times and bad...and she's always had a way of just being a real encouragement when I needed it most. I'm so honored to be able to call this gal a real friend. Yay! Is anyone really surprised that this guy showed up? ;) I mean, it would be like eating cake without frosting...It. Just. Doesn't. Make. Sense. If you didn't know, now you do: Bill Main = My Husband. Boom. I could literally write my first (and only) dissertation on this guy and his love and support for my blog. I mean, in all honesty, if it wasn't for his (loving) pushes, I wouldn't have even ever started writing and sharing with you all, three years ago! He loves this blog and believes in it more than I do, on some days. 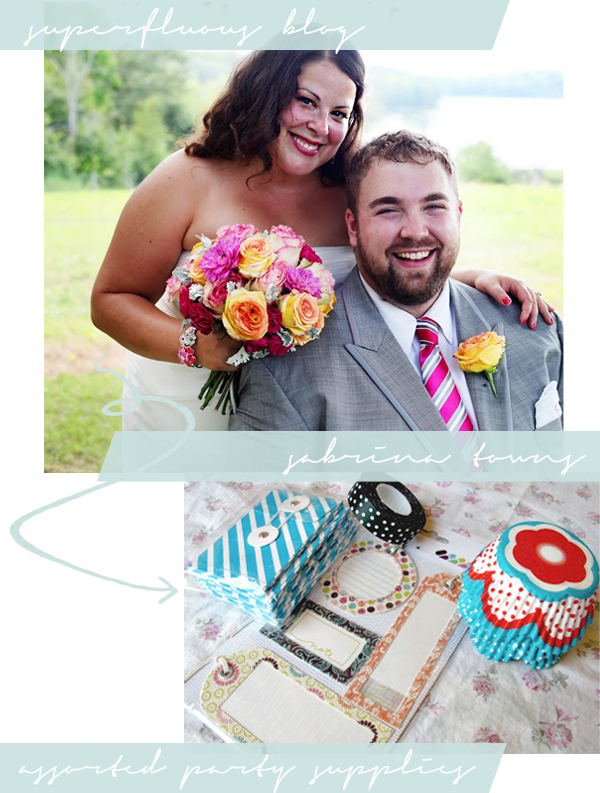 He IS Sweet Lavender Bake Shoppe and my, biggest Fan. I love that. I need that. That's the kind of encouragement and support I really need, especially when my brain is mush, my body hurts all over from baking and photographing all day long, I've received a terrible blog comment, Food Gawker didn't accept ANOTHER picture, or whatever. Seriously....I've got 19 accepted pictures and a whopping 71 declined. It HAPPENS! Haha. He is my number one "bouncer off-er" of ideas- I am constantly texting him pictures with a "This one or that one?? ", sometimes ALL day long. He is the one who really hears my bloggin woes and has always given me such sound advice. He also keeps me grounded and sitting here at this lovely big blue desk writing to you all, even when I really don't feel like I can anymore. I am BEYOND thankful for this "friend" of mine, both blog and real life speaking. Plus, I really find him handsome and love him dearly. Hehehehe. Bill has decided to offer one Sweet Lavender Bake Shoppe reader 50% off of ANY one item in his amazing (not biased at all) Etsy shop! Prepare to get some good giggles- his art almost always reflects his AMAZING sense of humor! I mean, it's really amazing. Ok now Katie! Last but certainly not least, Miss Katie. I met this lovely thang through Instagram...and I am SO glad I did! She is seriously on my top 5 list for Instagram pictures I hope to see when I sit down to flip through my feed. I kid not, if I see her name come up I s l o w l y move the picture so I can really soak in all the loveliness. I just adore them! Not only are her pics always gorgeous to the max (bright and super colorful), but they are SO CUTE and FUNNY! Her captions CRACK. ME. UP. I mean...tears. She has this little pup, Frankie...that just MIGHT be the cutest thing I have ever seen since our little puggie, Billy passed away. I may have a small thing for pugs (in any shape or form) though ;) Every single time he pops up I get all giddy inside because I know I'm in for a good laugh. He never disappoints. He IS the smuggest, most wonderful thing I've seen in a while. Oh and hey, if you run into her anywhere on the interweb, please tell her CONGRATS! She, my friends, just got engaged! Wheeeeeee! So fun. Not only that, but she's like this jewelry phenomenon! Her jewelry is so cute, and colorful, and sweet, and just skjnfvierbgvoeirng that it makes me wish I wore jewelry! Which I'm slowly starting to get into...soooo Bill Main, be on the lookout for a wish list filled with this sweet girl's stuff! 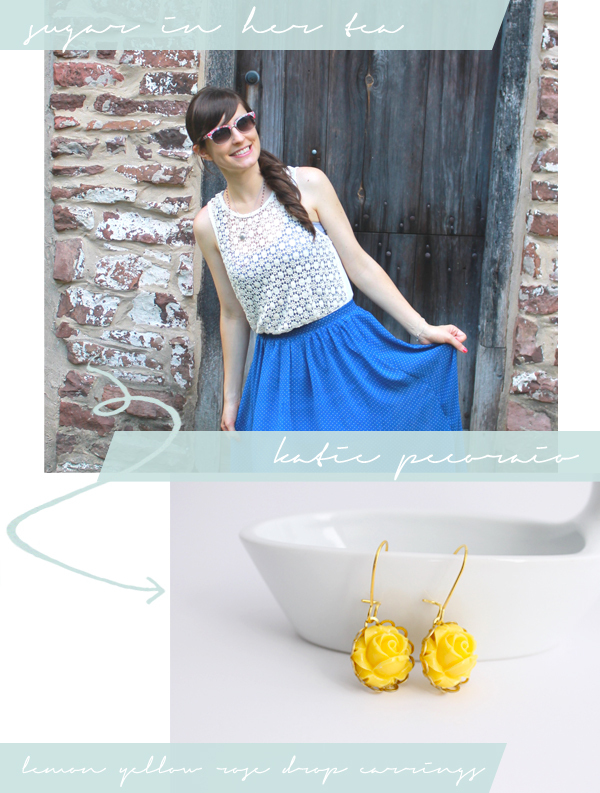 Speaking of amazing jewelry, hehe, Katie has generously offered to give one Sweet Lavender Bake Shoppe reader a pair of her Lemon Yellow Rose Drop Earrings! Aren't they just precious?! Perfect for summer! So friends, from the very bottomest (yes, bottomest) part of my heart, I sincerely THANK YOU for this last year. I love you all! Here's to another FUN year ahead!!! I love hearing from family and friends when they email, text or call to say hello and happy birthday. It makes me feel loved every year! 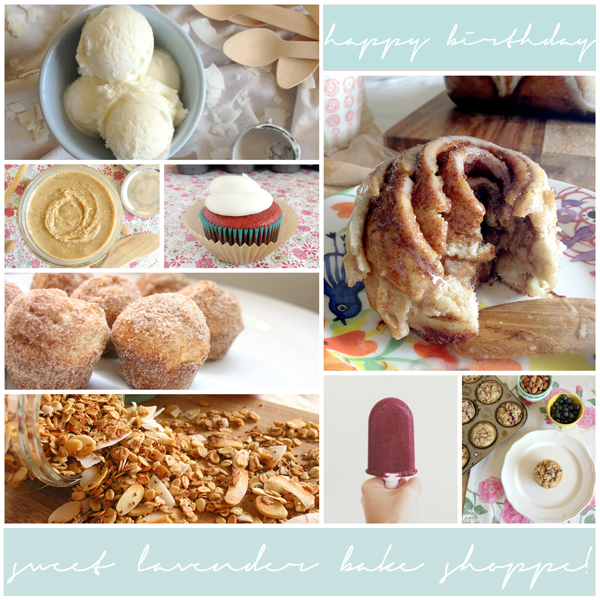 Happy Blog Birthday sweet friend! I'm so happy to know you and share life with you! Soo...maybe I'm a little slow, but how and where do I enter for the giveaway? Hi there! Entering is super easy! See that weird Rafflecopter thing up above? Just log in (just need your name and email, so I know how to contact you!) and do each of the thinngies to enter! Awesome thanks. I don't think the page was fully loaded on my phone the first time I saw this. It's nice to have a no-excuses "Me Day". Birthdays are amazing because you get to spend time with your friends and family! Cake......chocolate cake to be exact, best part of my birthday. ..and no calories because. ..it's my birthday lol. Oh how this made me giggle! Cake is definitely the best part of a birthday!